Media captionLiz Thomas on Antarctica's greater snowfall: "As things get warmer, they get wetter." Scientists have compiled a record of snowfall in Antarctica going back 200 years. The study shows there has been a significant increase in precipitation over the period, up 10%. The effect of the extra snow locked up in Antarctica is to slightly slow a general trend in global sea-level rise. This yearly extra is equivalent to twice the water volume found today in the Dead Sea. Put another way, it is the amount of water you would need to cover New Zealand to a depth of 1m. "There's been a lot of focus on the recent era with satellites and how much mass we've been losing from big glaciers such as Pine Island and Thwaites. But, actually, we don't have a very good understanding of how the snowfall has been changing. 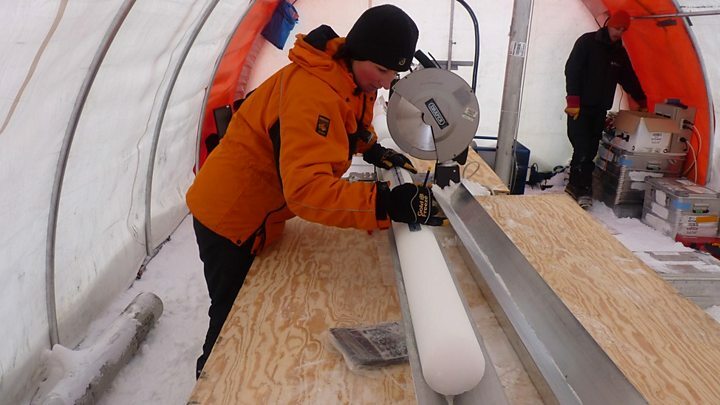 Dr Thomas and colleagues examined 79 ice cores drilled from across Antarctica. These long cylinders of frozen material are essentially just years of compacted snow. By analysing the cores' chemistry, it is possible to determine not only when their snows fell but also how much precipitation came down. For example, one key marker used to differentiate one year from the next, even seasons, is hydrogen peroxide. This is a photochemical product that forms in the atmosphere when water vapour encounters sunlight. "For us, that's perfect. Antarctica works like an on-off switch with the long 'polar nights' in winter and long periods of daylight in summer," Dr Thomas explained. Liz Thomas' research has been published in the EGU journal Climate of the Past.